The Huawei MediaPad M1 8.0 manual is pdf ebook that contains many instruction to operate and settings guide the tablet correctly. The Huawei MediaPad M1 8.0 measuring 214.4mm x 120.7mm x 7.9mm. It has 8-inch, IPS full-view-angle screen with a resolution of 800 x 1280. It's powered by Hisilicon Kirin 910 quad core 1.6 GHz processor with Mali450-MP4 GPU. The tablet installed Android 4.2(Jelly Bean) operating system with Emotion UI 2.0 features. There are 8 GB of ROM (can be customized to 16GB), 1 GB of RAM and support microSD up to 32GB. This tablet equipped with 5 MP rear camera and 1 MP front camera. 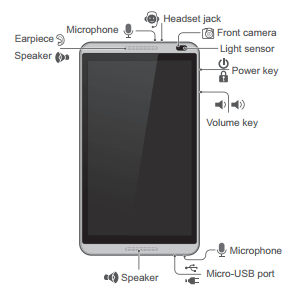 The Huawei MediaPad M1 8.0 user manual provide detail reference information such as HUAWEI MediaPad M1 8.0 at a Glance, Installing the SIM and microSD Cards, Charging the Battery, Connecting to a Wi-Fi network, Connecting to a Wi-Fi network using WPS, Sharing your network using a Wi-Fi hotspot, through USB tethering and using Bluetooth tethering. Then about Installing an application, Changing the theme, Adding widgets to the home screen, Managing your home screen, Setting the ringtone, Sharing files using Wi-Fi Direct, Bluetooth, Multi-screen display, and Copying files from a computer. Other information such as using contacts, importing and backing up contacts, Customizing message settings, Setting a screen lock, Setting the date and time, Locking a microSD card, Formatting a microSD card, Restoring factory settings, Updating your HUAWEI MediaPad and more.